There are two schools of thought when it comes to surprises. Some people don’t like to be surprised. They like to lead a nice orderly existence with predictable events that occur like clockwork; never upset the apple cart, deliver the paper at exactly five o’clock please. There are others however who enjoy a surprise, a little spice, an unexpected trip outside the comfort zone on occasion. I am stuck somewhere in the center; as age has advanced predictability is a comfort food best served at the proper temperature. That doesn’t mean the occasional surprise isn’t a welcome change. I got my occasional surprise recently when I was given a 2014 Ford Fiesta ST to live with for a couple of weeks. The surprise wasn’t upon first glance, though the thought of trying to put a middle aged somewhat portly frame inside the small hatchback did raise an eyebrow. 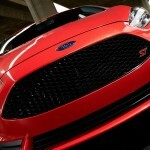 Nor was the color, “Molten Orange” according to Ford, although to us it looked red, a big surprise. 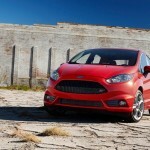 This is after all a “hot hatchback”, a class of compact car that demands attention. The 17 inch wheels along with a mean looking grille, chin spoiler and high rear mounted spoiler help grab that attention. 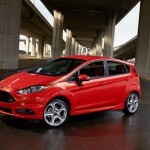 Designed in a partnership between Team RS in Europe and SVT in the United States, the Fiesta is being introduced to the US after plying the European roads since 2005. Our first thought was how the heck are we going to get in this thing? The first surprise was just how effortless it was. The Recaro bucket seats are very comfortable and give the overall impression that this little machine is ready to tear up some road; the fit, even for the portly middle aged guy was, you guessed it, surprising. But the surprises were just beginning. On the road the Fiesta is crass, crude, obnoxious, and loud; an absolute beast and that’s meant in the most complementary way. The High-output 1.6-liter GTDI EcoBoost engine delivers 197 horses at 6350 RPM. Combined with 202 pounds of torque at 4200 RPM the launch is nothing short of astonishing. The power to weight ratio will put a driver back in those Recaro seats and sometimes leave you trying to catch up. The only transmission offered is the six-speed manual and that’s just fine with us. In town the Fiesta scoots around like an angry cheetah. It takes corners like it’s on a rail thanks in large part to the torque vectoring control which helps by overpowering the outside wheel in a slippery corner relative to the inside wheel through selective braking of the inside wheel. And all of this fun doesn’t come at the expense of fuel mileage. 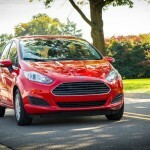 The Fiesta gets an impressive 35 MPG highway and 26 city. All of Ford’s infotainment and driver assistance technology is here; the Ford Sync that includes Bluetooth, USB inputs, SD card slots, the MyFord Touch screen system, and premium Sony audio. The sound system was great but thanks to a modified version of the sound symposer implemented on other Ford products the engine provided the sweetest tunes. The sound symposer provides an enhanced soundtrack on the open road when the pedal is pushed. It’s unique for Fiesta in that for the first time the engine sound is directly fed into the passenger cabin to accentuate feedback quality and response. It provides a great background soundtrack as you fly down the road. During our two weeks with the Fiesta we took a long road trip; a nine hour jaunt from Florida to North Carolina for a NASCAR event. You might think a long road trip in such a small compact car would be downright torturous. You’d be wrong. That’s because another surprise was just how comfortable that trip was. Those Rocaro seats can support a portly middle aged man for a long trip unexpectedly well. You may not glide over the road like a larger luxury vehicle, but the ride is amazingly smooth. The cabin noise is also minimal and the power is more than enough to cruise along at 80 MPH with no effort. Truth be told there wasn’t much opportunity to drive the Fiesta while in North Carolina thanks to a bout of pneumonia that left this middle aged portly man in the hospital for an entire week, but that is a story for another day. 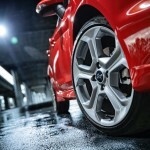 The final surprise for the Ford Fiesta ST is the price. The base MSRP is just $21,400. Our model topped out at a very reasonable $25,955 delivered. 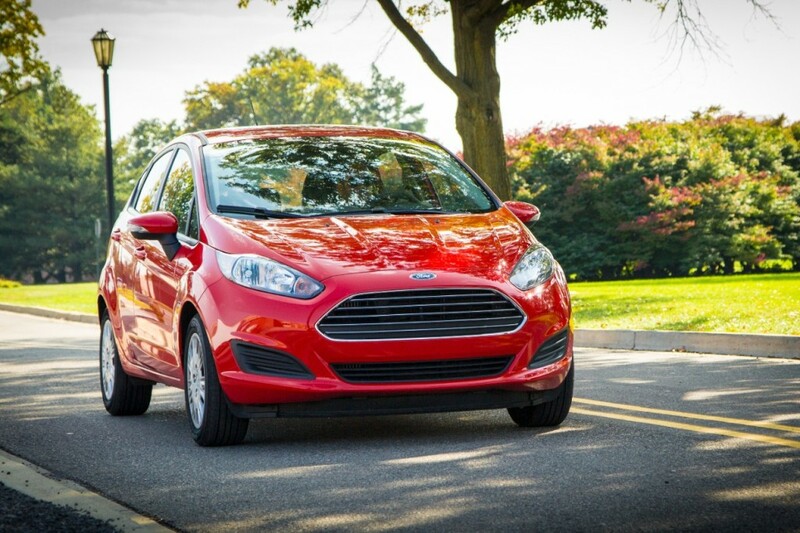 It’s no wonder that the 2014 Ford Fiesta ST recently won the 2014 Motorweek Drivers Choice Award for the best subcompact car. After living with it for two weeks and leaving with a smile on our face, that’s no surprise at all.